(Bloomberg Opinion) -- Much has been made of the degradation of the $7.5 trillion U.S. corporate debt market. High yield offers too little, well, yield. And “high grade” now requires air quotes to account for the growing dominance of bonds rated BBB, which is the lowest rung on the investment-grade ladder before dropping into “junk” status. And then there’s the massive market for leveraged loans, where covenants protecting investors have all but disappeared. In the event this warning rings a bell, be heartened that your memory is still largely intact. Investors blindly following credit rating firms’ designations on subprime mortgages despite a clear degradation in the due diligence upon which the ratings were assigned ended up regretting such faith when the financial crisis hit. So why not treat the BBB portion of the bond market for what it is: a high-risk slice of the corporate debt pie. Keeping count of “fallen angels,” or those investment-grade bonds that are downgraded into junk territory, will become a spectator sport. 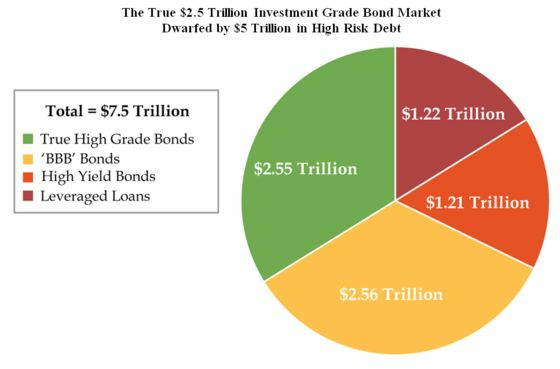 With that as a backdrop, add to the BBB market what are already designated high-yield bonds and leveraged loans and you arrive at $5 trillion, twice the size of what investors should realistically classify as money-good investment-grade debt. The leveraged loan market is generally where companies whose credit is so weak they can’t access the high-yield bond market go to attain financing. It just exceeded the high-yield bond market in size, growing to $1.22 trillion compared with high-yield’s $1.21 trillion, according to Fitch Ratings. Query institutional investors and they will answer that they’re increasingly guarded in their approach to the market. The investment community’s suspicions are amply reflected in the awful performance put in by the investment-grade market this year, with the Bloomberg Barclays U.S. Corporate Bond Index dropping 2.80 percent through Friday. Among 19 major parts of the global bond market tracked by the Bloomberg Barclays indexes, only dollar-denominated emerging-market debt has done worse. The extra yield investors demand to own investment-grade corporate bonds instead of U.S. Treasuries is equally indicative of investor skepticism. At about 1.25 percentage points, the spread has expanded from an average of 0.85 percentage point in February to the widest since 2016. But ask yourself this question: How many small investors perceive the corporate debt market as two parts high-risk and one part low-risk? According to State Street Advisors, despite the underperformance of investment-grade funds, June saw continued inflows of $2.8 billion into the space while high-yield sustained outflows of $2 billion. Through the first six months of this year, investment-grade inflows totaled $5.6 billion while high-yield funds bled $5.9 billion. The reality is precious few retail investors conceive of the ticking time bombs populating what they believe to be the safest slice of their portfolio pie.